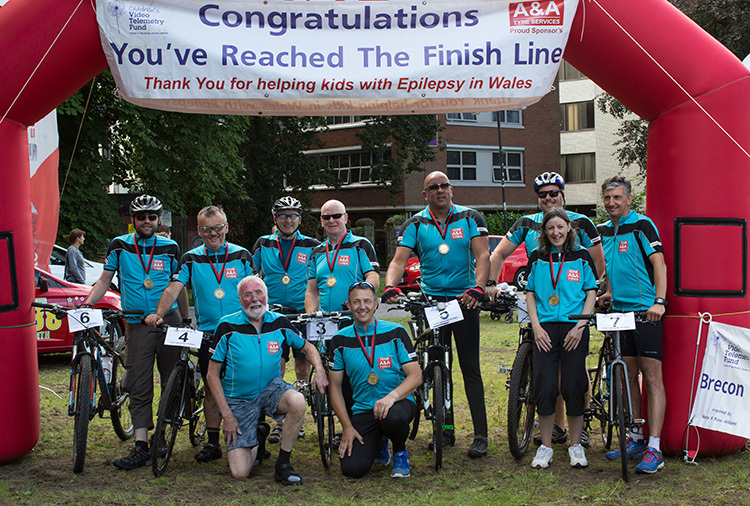 This year’s event for the first time was not only raising money for the Children’s Hospital of Wales Epilepsy unit but to also to fund a special adapted bike for Bailey, his love of cycling is the reason behind our charity bike rides. We had Record numbers of over 140 cyclists taking part from Brecon to Cardiff along the Taff trail. A&A Tyres have been fund raising alongside Craig and his family to fund a Telemetry suite at the Children’s Hospital of Wales Epilepsy unit. Craig’s oldest son Bailey who suffers from a rare form of epilepsy which took over 2 years to diagnose, if Wales had their own Telemetry suite Bailey could have been diagnosed in a week preventing him from a whole load of side effects. This year’s event had the backing from First Stop the Bridgestone tyre network. Both Stuart and Dave are showing their support after joking that they’d don the Lycra if A&A Tyre Services decided to become a member of the First Stop network again, not thinking that they would agree so soon afterwards. On August the 7th the first Stop crew including Ollie who manned the finish point took part in our most successful ride to date. For the first time since the annual event was held back in 2011, Bailey and younger brother Ross actually completed the final few miles of the course on their tag along bikes. Baileys is specially adapted which goes behind Craig’s bike. A&A Tyres Ron Austin also commented, we will always support Craig and his family in the battles they face as a family. Craig who organises the rides would also like to thank all the cyclists, marshals and sponsors for all their hard work. I take a lot of the praise for these charity rides, but I couldn’t do what I do without their help.